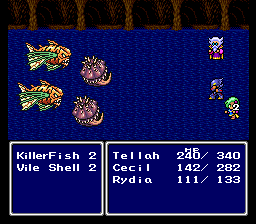 Final Fantasy IV Namingway Edition is an attempt to bring Final Fantasy IV (FFIIUS) closer to its Japanese counterpart. This uses the excellent work by vivify93, Project II, as a base. 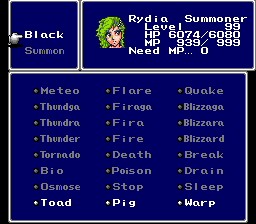 Using modern names where possible, and abbreviations where necessary, all items, spells, commands, jobs, and monsters are renamed. 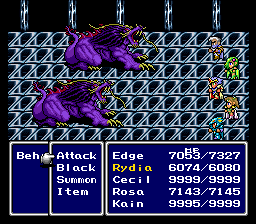 Monster stats, including the final boss, are restored to their original, along with spell learning rates. Also added to the mix is a B button Dash rather than a toggle or just walking everywhere. Also added is the original treasure chests and save point graphics. 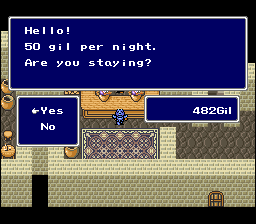 The maps have all been restored back to their original FFIV, including the Developer’s Room. Items now have extended descriptions. In addition, the script has been heavily worked on recently to bring it as close to modern translations as possible within text limits of the game. This used the notes by Mato of Legends of Localization, as well as looking over the PSP and DS translations to hopefully offer the best script possible for the SNES version of the game. 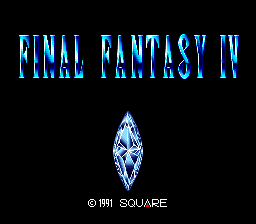 Apply to a clean, unheadered Final Fantasy II US (1.1) ROM using Lunar IPS. Join in on the discussion here.